Our boiler was badly piped with a single riser coming of it, no header and no equalizer. I repiped it but still appear to have the two major issues that started this process. The heat is massively unbalanced. It is much warmer on the second floor than the first floor. I moved vents around last year so the bottom radiators have fast ones and the second floor has slow ones (Gorton #4). It only slightly helped. The radiators on the first floor are probably half the size overall of the second floor but I understand that radiator size might not matter since it won't change the amount of steam being delivered to the radiator, so I'm more than a little stumped. ALSO, the boiler is short cycling from pressure. The main seems to be well vented. It runs 20 minutes or so for pressure to build (I assume the air is clearing) and then begins short cycling in periods of 1.5 minutes on and 1.5 mins off. I sort of wonder how the boiler survived 25 years. Given the shortness of the cycles and the heat on the second floor, I tend to think the two issues aren't related but please correct me if wrong. Got a question, how is the main the vented?? The conesenses on here like one Gorton #2 for every 20' of main run. First off... the "short cycling" after 20 minutes firing is almost certainly caused largely by the boiler being oversize for the connected load -- although it is probably made worse by somewhat weak main venting. Not much that can be done about that, although if it is oil fired a very qualified burner technician might be able to calm it down some with a smaller nozzle. Repeat: very qualified. Down firing is not for the inexperienced. Second, what do you have for main vents? If you don't have them, or they are too small, that may be part of your problem. Now... radiation. It is not true that radiator size is not a factor. All else being equal, a radiator will deliver heat in direct proportion to its size -- 240 BTU per EDR square foot. That being said, that depends on how fast it can get steam, and a large radiator can be calmed down by providing it with smaller slower vents. A small one, however, cannot be made more enthusiastic than it's size -- once it is filled with steam and the vent closes, that's it. That's all she'll do. You may have a problem with the upstairs radiators simply being too much too big. Have you evaluated the heat load with regard to the radiator size? In any event, making sure that you have enough main venting, to get the steam to the radiators fast, and fast vents on the downstairs radiators plus slow ones upstairs should help some. It's a little odd that the rads on the second floor are much larger than those on the first floor. Do the first floor radiators begin to heat later than the second floor radiators? Are the first and second floor radiators on different mains? If not are the second floor radiators closer to the end of the main than the first floors? Have you checked all the horizontal pipes with a level to make sure the pitch is right? If water can collect in a main or radiator runout it will collapse the steam and drastically slow the ability of steam to get past it. Radiator size definately matters......It's time for a heat loss and radiator survey. If the radiators on the first floor are not large enough, the house will be cold on the first floor, compared to the second. So if this is a pretty old house, the 2nd floor EDR may have been oversized to deal with no attic insulation and leaving the windows open overnight. These conditions may have changed today. After you get the venting right you can always add a two stage gas valve. hey man, not to hijack the thread but if you are upsizing radiator and you are in NJ, I have one for you and will let it go for a case of beer. I can get you dimensions, but guessing at it as I sit here in my office it is 40 inches long by 28 inches high and it'll take two or more of us to get it in your truck. Thanks all - I'll check on the exact size of main vent. The boiler is definitely oversized and may twice as big as needed. At least two and maybe three first floor radiators were changed at some point. Two of the spots seem like they were once sunrads but these dinky little things were put in place that don't put out much heat. They cast but like a single pipe with fins. Does increasing downstairs make more sense than decreasing upstairs? ok, I will check dimensions and post back here tomorrow. I may have overshot on the height estimate now that you point it out. maybe more like 20 or 22. its a big old cast radiator that's in excellent condition (one pipe system). If the boiler is already way over-sized, it definately makes more sense to increase the radiation down stairs than to reduce the up stairs and make the boiler even more over-sized. Make sure you have as much venting on the mains as possible and also keep the pressuretrol set as low as possible, .5PSI Cut-in and no more than 1PSI differential (Cut-out). Steam moves faster at lower pressures. 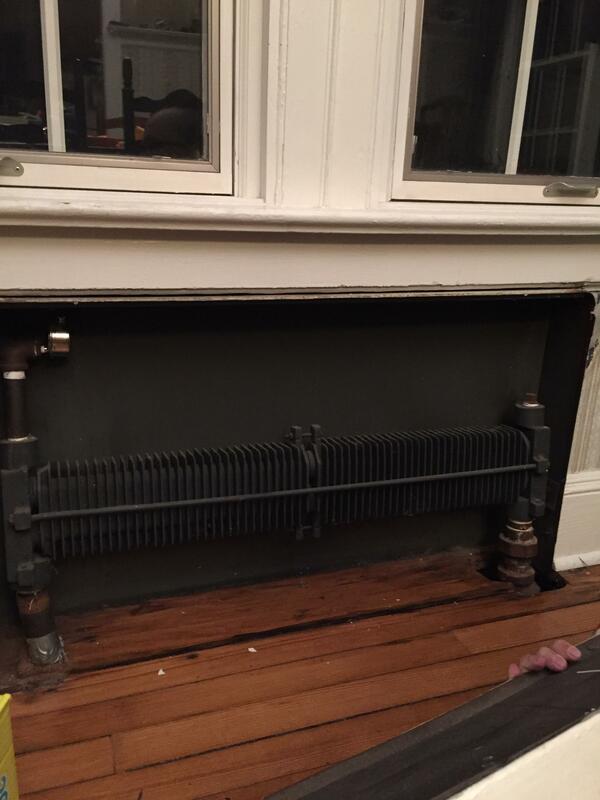 the radiator I have is 19.5 high, 38 wide, and 8.5 deep. let me know if it will be of use for you. It is in great shape. Sounds like a pretty big one. At this point might be helpful for OP to post some pictures of his boiler and revised piping, hopefully that will garner some additional ideas. A full radiator survey would also help. Hi all - The main is about 32' long (2" pipe) and has a Gorton #1 at the drop. I was surprise as it is clearly undervented. Will a #2 do it? I'm not sure I can get two vents in there. I'm a little confused on radiator sizing. I did all the measurements and worked with Dan's book (and the Burham guide) to work out the EDR. One of the 32" convectors has an EDR of 33 square feet, which is close to the 13 section radiator upstairs that puts out a LOT more heat. I'm a little stumped as to why that little radiator is given such a high number. It is cast iron but short and has two pipes going through it (I used the Burnham book). The other one is even bigger. 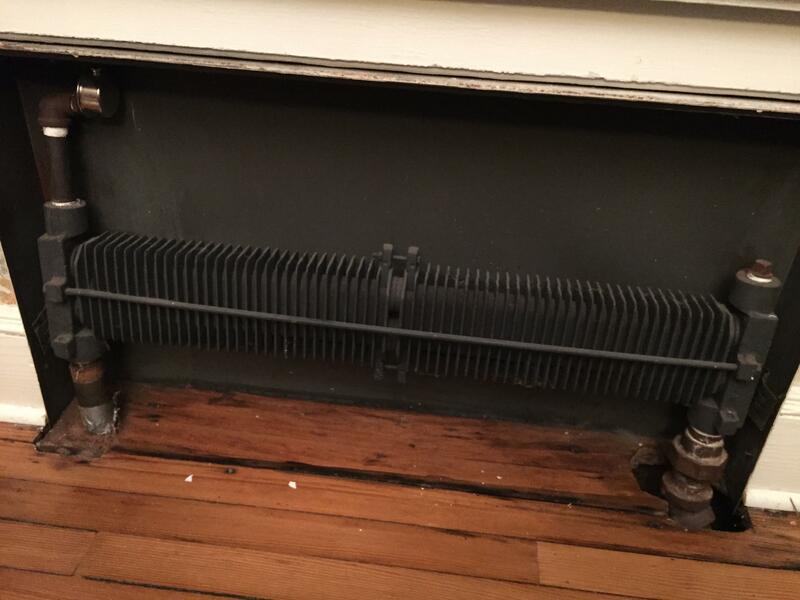 I have a hard time believing that putting a big cast iron radiator in the same spot wouldn't be warmer but maybe I'm wrong? Is there a formula for matching the EDR of a radiator to the size of the room? Puff - I'll try to message you about the rad. I'll post a picture later - they aren't sheet metal. Nothing is in the way. The insulation behind them isn't great, but they just don't seems to put out much heat. The got very hot but aren't very big when compared to traditional radiators! Convert EDR to btus by multiplying x 240. Do a heat loss calculation for the rooms in question, and you will know what size radiator you need. Here is the convector below. Is there a way to calculate nearly loss without tearing open the walls? It is an old house and I think insulation is patchy. Attic is solidly done. Radiators both convect and radiate. That in conjunction with the greater thermal mass helps it feel warmer for a longer time. Even a little rad has a lot of surface area. I'm not familiar with convectors so I couldn't say if those are original or not. I'm guessing not as most houses originally had rads that matched in style. Whatever you do, put some reflective foil behind that rad; it really helps direct the output into the room. P.S. I'd personally be interested to see a better pic of your interior storms, if that's what I'm seeing.